The NWW provides education and social support for woodturners in the Northwest Washington region. Our primary goal is to provide a forum for turners of all skill levels to exchange knowledge, ideas, and information about safe woodturning. NWW meets every third Thursday of the month, starting at 6:30pm and usually last 2-3 hours. The exceptions to this are April when the meeting is held at an alternate location, and December when we have no meeting. Members are invited to arrive at 5:30 pm and bring dinner or simply socialize. 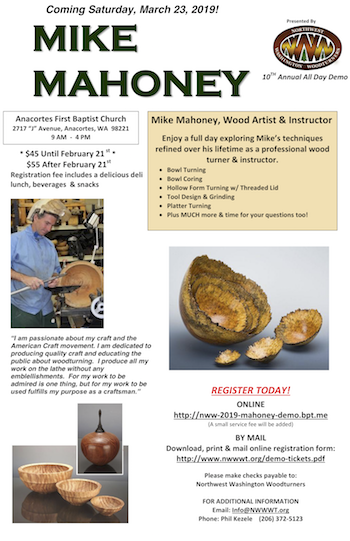 Meetings are open to anyone interested in woodturning. Guests and visitors of all skill levels from beginners to advanced turners are always welcome. See the meetings page for more information as well as driving directions, and see our membership page for more information about joining.